Not since the disgraced Reggie “Kardashian” Bush, the only Heisman Trophy winner stripped of the award, and the shamed Marion “BALCO” Jones, forced to return Olympic track medals, have I felt so conned by a high school athlete. Dennis “Shoe Money” Smith Jr. earned his way into my hall of shame. Smith’s one-and-done basketball season at N.C. State didn’t live up to the image he presented in high school at Fayetteville Trinity Christian, an hour south of N.C. State’s campus in Raleigh. His one-and-done season with the Wolfpack was about padding his stats for the NBA draft more than leading the program. Apparently, he's offering more of the same in the NBA. The Dallas Mavericks’ 2017 lottery pick is the subject of trade rumors reportedly because he doesn’t want to share the ball with Luka Doncic, the Mavs’ 2018 lottery pick. Smith disputes that notion, but he also denied everything about his N.C. State days. Without Smith, though, N.C. State basketball has gained credibility and stability under second-year coach Kevin Keatts. The No. 21-ranked Wolfpack pulled off an amazing comeback win on Saturday over Clemson. N.C. State didn't play with that kind of grit with Smith as the face of the program. Yeah, I know, kids are kids. Junior Seau's persona changed with celebrity, but he always will be forgiven as one of my all-time favorite athletes -- the greatest three-sport high school kid (football, basketball, track) I ever covered. I have a signed photo of him on my wall at home. Seau, though, remained true to his sport, pro football, and, most importantly, his teams. He also established the generous Junior Seau Foundation. Over the years, my admiration has grown for San Diego athletes I first covered when they were high school kids that have remained the same person upon pro fame. Athletes like John Lynch (NFL), Tony Clark (MLB), La' Roi Glover (NFL) Stephen Neal (NFL and real wrestling), Joe Salave'a (NFL), Luke Walton (NBA) and Monique Henderson (Olympic track) are the most recognizable names among others that I can mention. My disappointment with Bush, Jones and Smith is they sold out. The more attention came their way, the less they saw a world bigger than them. I could have included Tiger Woods on this list, but he he was a selfish brat before high school. I covered him as a 10-year-old in the San Diego Junior World Tournament. As background, I grew up reading the Detroit Free Press, which featured the high school sports stories of the legendary Hal “The Swami” Schram (the state’s Mr. Basketball Award is named for him). In middle school I wrote him a letter that he answered with advice. At Helix High near San Diego, he was a national football recruit with world-class track potential. He also was a good student that said he wanted to become a doctor. When I first met him, he burned up the track as a sophomore at the 2001 California state track championships. He was content to be one of the guys, shining individually and reveling in the relay team’s success. Then sometime during his senior year a cocky arrogance overtook his persona. He could attend any college he wanted with his talent and academics, but I heard him disparage his local school, San Diego State, in an interview with me in front of his Helix teammates, kids that would have loved a scholarship opportunity to play at SDSU. He stooped to another “me-me” level once the glitterati found him at USC. He liked to dress in expensive clothes (everyone winked about it) and later dated Kim Kardashian, entering that fraud reality TV world. His stepfather and mother, now divorced, requested security for a free football camp kickoff event at an event put on by the San Diego Hall of Champions charity, where I worked at the time. Eventually, Bush and his family were exposed for accepting benefits from a prospective agent – the same agent who blew the whistle on Bush when he signed with a different agent. Bush cavalierly denied everything. 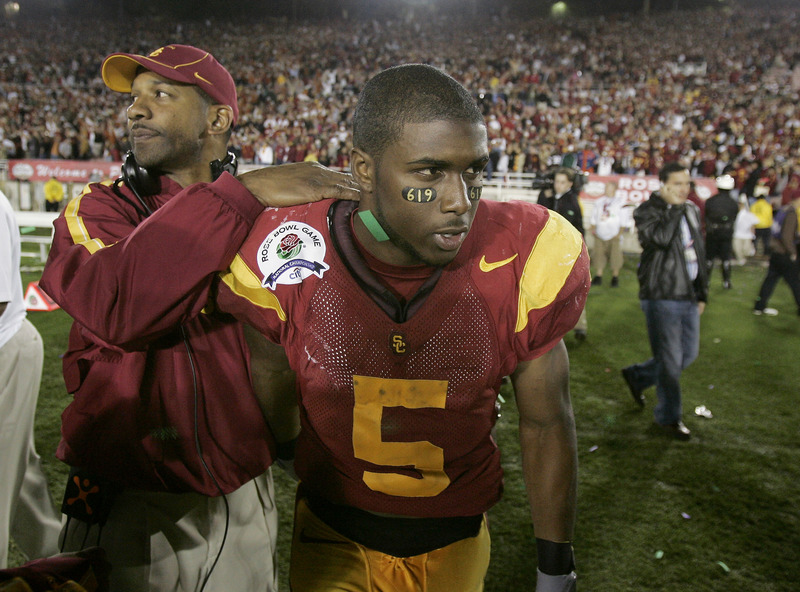 Once the NCAA declared him ineligible and slapped USC with penalties, he was forced to return his Heisman. USC football slipped into a decline. Former USC athletic director Pat Haden told the “Los Angeles Times” Bush wasn’t contrite about the ugly chapter that shadowed an iconic football program. Meanwhile, he kept making millions in the NFL. When Bush was with the Detroit Lions in 2014, he was among NFL players that wore “I can’t breathe” clothing to protest the death of Eric Garner at the hands of New York police. Bush was injured and thus not in uniform on the sideline. His talent was as muted that day as was his voice for social activism. Imagine the power of his voice if he had maintained academic and athletic integrity. It might have been strong enough to support Colin Kapernick before debates over his kneeling were manipulated into a flag protest. Bush once wanted to give back to the world as a doctor. Instead, he’s a taker not welcome on his college campus. One more thing about Bush: In a strange twist, years later in North Carolina I covered another running back that was a national football recruit with world-class track potential and an ambition to become a doctor. The difference, though, is Bryce Love of Wake Forest High, near Raleigh, is conscious of being a role model, especially for young African-Americans. He has graduated with a degree in human biology from Stanford. He’s awaiting the 2019 NFL draft, but he eventually plans to practice medicine in underserved communities. The only Heisman controversy surrounding Love was after finishing second in the 2017 balloting, he opted to remain at Stanford working on his degree rather than attending Pac-12 media days. Some writers criticized him for damaging his Heisman hype. Love is turning out to be everything Bush could have been. Jones learned to obfuscate, too. In 2004, her name surfaced in the BALCO performance-enhancing drug scandal that included baseball cheater Barry Bonds. But there had been PED suspicions during her prep career at Thousand Oaks High, near Los Angeles, due to posting world-class spring and long jump marks in international competition. Her name was entered into the USA Track and Field drug testing pool. When she didn’t show up for tests, she pleaded the notices were sent to the wrong address. Johnnie Cochrane, O.J. Simpson’s lawyer, had her ban overturned. As a high school athlete, she seemed engaging and genuine when I watched and interviewed her in early 1990s California state high school meets. In basketball, I saw her perform a reasonable facsimile of Basketball Hall-of-Famer Julius Erving’s iconic reverse layup in the 1980 Sixers-Lakers NBA finals. Her high school team traveled to San Diego to play Rancho Bernardo High in the 1993 state playoffs. She floated from one side of the lane to the other for a reverse layup. You had to see it to believe it. People not in the gym didn’t believe me (no cell phone video in those days) – until she started winning Olympic medals in the sprints and long jump. With her hoop talent, Jones accepted a basketball scholarship to North Carolina. She helped the Tar Heels win an NCAA title, but she also got her name out of USA Track and Field’s drug testing program. When she returned to international track, Jones always denied using drugs despite red flags. That included one raised by her then-husband, world-class shot putter C.J. Hunter, whom she met at North Carolina, failing drug tests in 2000. Later, In the federal BALCO investigation, BALCO founder Victor Conte and Hunter, while facing charges, both said she used drugs. If Bonds hadn’t used drugs, he’d be in the Baseball Hall of Fame by now. If Jones hadn’t used drugs, maybe she doesn’t set so many track records (later stripped ), but she could have remained upon her throne as a Title IX Queen and example to young girls. Since her fall from grace, the women’s track and field popularity she generated has plummeted. At least she apologized, even if it wasn’t until she was on her way to prison for drugs and check fraud. Smith, though, has been as arrogantly unapologetic as Bush. He hasn’t answered questions that surfaced a year and a half ago about the FBI investigation that charged his father accepted $40,000 – peanuts compared to the millions he earns in the NBA. The FBI investigation revealed adidas delivered the money to his father through an N.C. State coach. When Smith committed to N.C. State, it was a recruiting coup for then-Wolfpack coach Mark Gottfried. Smith’s cover story was he grew up an N.C. State fan. He said he liked being an underdog. His attitude seemed refreshing in an era with one-and-done basketball recruits following each other like lemmings to Duke and Kentucky, one-and-done pit stops to the NBA. I heard Smith utter “his old school” feelings when he played as a high school junior in Raleigh’s 43rd annual Holiday Invitational, in December 2014. That week he stood out as much any talent – maybe more with his heady play -- among the tournament’s glittering field of future NBA first-rounders: Harry Giles (Sacramento Kings), Jamal Murray (Denver Nuggets), Thon Maker (Milwaukee Bucks) and Brandon Ingram (LA Lakers). Smith led his team without forcing the action. He scored but also set up his teammates. He spoke humbly after games. If those observations were ever an indication of his true personality, that was the last glimpse. After he suffered a season-ending knee injury in August before his senior year, he graduated early and spent the winter and spring as an N.C. State student while rehabbing his injury with school trainers. Ideally, he could have laid a leadership foundation for the next season. Instead, he played his freshman year selfishly. But unlike Bush and Jones, Smith’s misdeeds have a silver lining. N.C. State’s miserable 15-17 season with Smith ended with Gottfried’s dismissal. Gottfried’s previous seasons of leading N.C. State to the NCAA Tournament his first four years was flushed down the toilet. So maybe N.C. State, unlike USC shunning Bush and track wiping Jones from its records, should invite Smith back to campus. As part of the recognition, the Wolfpack can thank him for creating an opening for Kevin Keatts.